I have incredible friends in wet shaving. 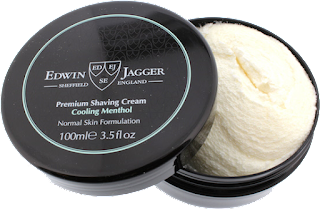 Wet The Face has been around since March of 2015 and in this time I've been sent many samples from around the world which leads me to one of them from England called Edwin and Jagger Cooling Menthol shaving cream. The sample package is just enough for one to two shaves or at least that's how it worked out for me. If you do have any left it's sure to be safe with the snap on lid provided on the sample tub. I can't be sure but it looks to be about 1oz. The scent of this cream was something I had to get used to. It didn't strike me as something I would have reached for if it was on the shelf in a store. This cream gets bonus points for its Cooling Menthol effect, amazing lather and being Natural & paraben free. According to the company, you'll get a better lather if you use a brush but you can still just use your fingers as well. My bowl lather was just fantastic I produced a creamy rich lather that was just a pleasure. I had so much lather on the brush it was truly something to see. Once you start brushing it on it got right into the beard. I noticed that it was foamy at first then it slowly started to change to the consistency of yogurt a very creamy rich lather and with a beard showing more than 5-days of growth it amazingly went on like I was painting my face. It provided total coverage. 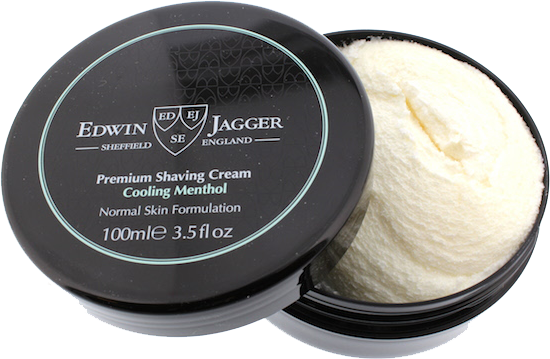 Then the menthol starts but not harsh it comes up slowly and then adds to the pleasure of the shave. This also stays with you for 20 mins or so which adds to the great post shave feel. The slickness and glide are just the best. Most creams I use seem to offer this more than shaving soaps do of course this is just my opinion. So, I had a great shave and would recommend this to anyone looking for a new cream to try. Truth be told, the scent was not the star of the show with this cream but rather the Cooling menthol effect it's something you should experience and if you like that cool feeling then you can explore the other offerings artisans have that will send you into menthol Nirvana.